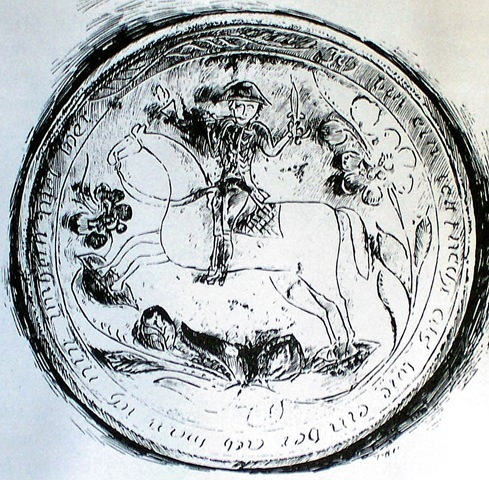 The mounted officer charged the enemy. Or rallied the troops. Or maybe just smoked a pipe while out on a joy ride. Whatever his intentions, they were important (or interesting) enough to merit eternal commemoration. 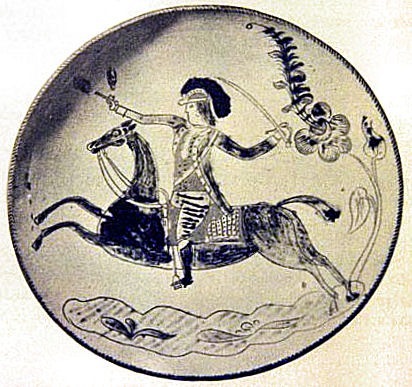 His ride was depicted several times on earthenware plates made in southeastern Pennsylvania between the mid 1770’s and 1849. So who was this rider? A Philadelphia Light Horse Dragoon? He often wielded saber in one hand, pistol in another. A dragoon on the attack. His attire suggests this, and the earliest plates date from the Revolutionary War. But the rider probably morphed into George Washington soon after the General’s death in 1799. Commemorative prints of Washington were widely popular then. The rider sometimes blew a bugle, with pistol or saber accompanying, as if George were urging his forces forward. Here was a known pattern ready to fulfill demand for memorabilia. But what about the pipe that sometimes appeared? Possible references to intention and identity were inscribed around the rim of the plates – when one was present, the earliest plates have none. From 1805: “I have ridden over hill and dale and have found disloyalty everywhere.” This saying was associated with Washington’s doubts when the going was rough. 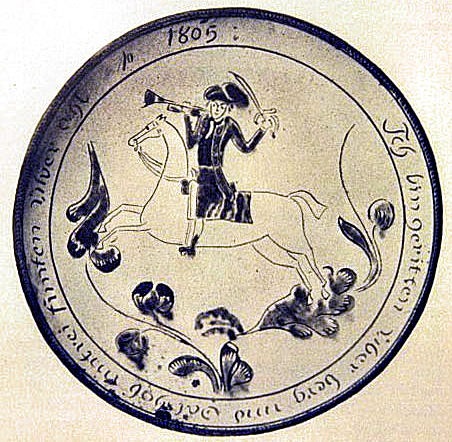 Tulip Ware of the Pennsylvania-German Potters. Edwin Atlee Barber. Dover Publications/New York. 1926. The tulip has been around for a long time. It’s been called the holiest of flowers, the herald of spring, an aphrodisiac. 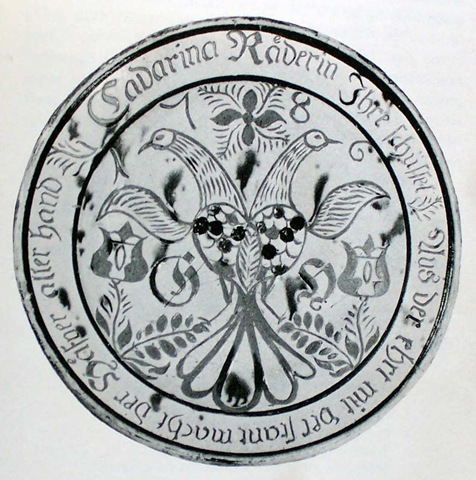 The tulip inevitably pops up during any investigation of early American pottery, an entire branch of which is often called “Tulip Ware.” Of all the floral motifs available to the potter, the tulip is one of my favorites. Particularly the more stylized versions. Some are hardly recognizable, almost cosmic. But there’s another reason why I appreciate the tulip motif. In 1570 tulips were introduced into Holland after a long journey from the northern Himalayas via Persia and Ottoman Turkey. These were not the tulips of today. They carried a certain virus that caused radical deformation and discoloration, resulting in blooms of singularly fascinating qualities. The Dutch had never seen anything like it. They began trading bulbs with genealogies of particularly spectacular blooms. Higher and higher prices were paid. Rather than wait for a bloom to evolve, speculators began trading on the bulb’s expected merits. A futures market evolved. What was traded was not the bulb, or even the note certifying that a bloom to be was of a particular genus, but on the value attached to the note. Then on the value attached to the value of the note. The bulb itself had long since bloomed and died off, if it ever existed at all. Fortunes were amassed and spent. All on credit. The market for bulb futures notes grew into a Tulip Craze of mammoth proportions. Is this story beginning to sound familiar? Would any Dutch trader of the time have difficulty jumping into the Derivatives Market of 2008? There was easy money to be made. Just wrap a seductive image around a potent lure such as greed, and it is easy to see how far things can go. It was the world’s first stock market bubble. I love the tulip motif. I appreciate it’s formal qualities, and it’s iconography. But most of all, I keep it at the forefront of motifs I employ as a sort of reminder. Even if only to myself. TulipoMania. Mike Dash. Crown Publishers/New York. 1999.